(These lyrics also work well with Mr. Schwarzman and Mr. Peterson, except they already cashed in big with Blackstone's IPO, something Mr. Rubenstein hopes to do.). 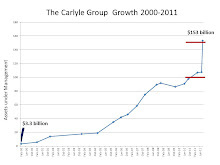 Update 2-10-12: As for Jesus awarding PEU's more, one Carlyle ex should know. Updated 2-12-12: Will Micheal Huffington and Menachem Youlus sing along? Update 9-18-12: Forbes ran its homage to Rubenstein.